Today is a very special day. 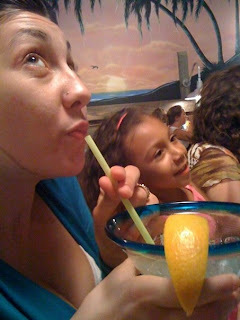 Today is the second of September - meaning my niece, Isabella, is 7 years old, and my sister, Lori, is 20-something-ish. How cool for my sis, to share her special day with the most special lady in her life. Bella loves it, too. She and mommy always wear tiaras together and have to explain to everyone that they really do have the same birthday. They are so much like each other and are very close, and this is just one more thing to solidify the mother-daughter bond they share. My biggest birthday wish for them is that this bond only gets stronger as the years go on; that no matter how many birthdays pass, Bella will never be too cool or too busy or too grown to appreciate how neat it is to share this day with the sweet one who birthed her. So, I raise my glass (of water - still no drinky for Nikki) and toast to my best friend and favorite girl. You two are amazing together, and you both bring so much joy to my life individually. Here's to many more September seconds! !